Cayuga Lake is the longest of the Finger Lakes at just under 40 miles (64 km) long. Its is approximately 1.7 miles wide on average and it is 3.5 mi wide at its widest point near Aurora. It is approximately 435 ft deep at its deepest point. Cayuga Lake is about the mid-point between Rochester NY and Syracuse NY. The NY State Thruway runs East and West about 10 miles North of the lake. The northern end of the lake flows into the Montezuma National Wildlife Refuge, consisting of approximately 7,000 acres of wetland that provide habitat for over 250 different birds and wildlife species. 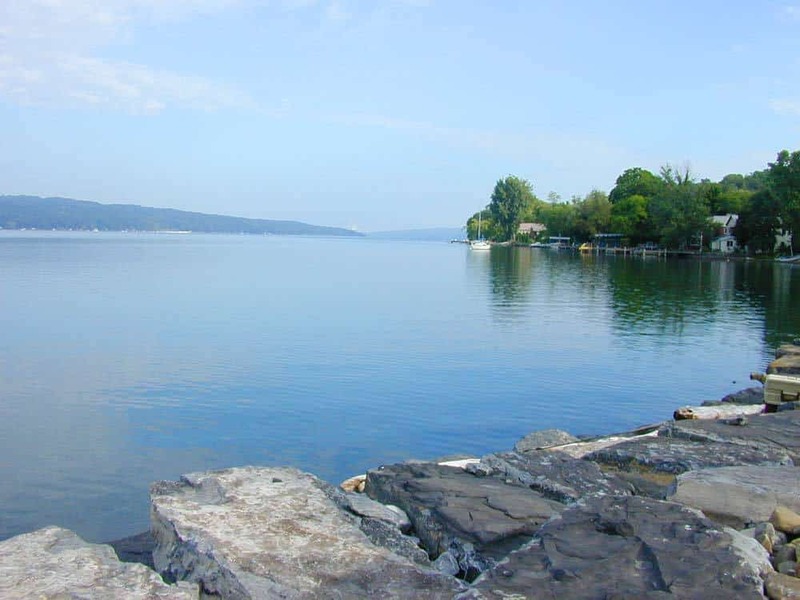 At the Southern end of Cayuga Lakes lies the city of Ithaca, New York, site of Ithaca College and Cornell University. Cayuga Lake Real Estate features spectacular scenery and access to boating, fishing, charming villages and award-winning wineries. Cayuga Lake restaurant choices include charming bistros, quaint cafes and awesome water front dining establishments. All while enjoying wonderful Finger Lakes wines. You will find the local culture to be rich and varied. The following list includes Cayuga Lake Real Estate lakefront listings near the perimeter of Cayuga Lake. These are the type of properties Lake to Lake Real Estate specializes in. To see a complete listing of every house for sale please use the search box. The data relating to real estate on this web site comes in part from the Internet Data Exchange (IDX) Program of the CNYIS, GENRIS and WNYREIS (NYSAMLS's). IDX information is provided exclusively for consumers' personal, non-commercial use and may not be used for any purpose other than to identify prospective properties consumers may be interested in purchasing. Real estate listings held by firms other than Lake to Lake Real Estate are marked with the IDX logo and detailed information about them includes the Listing Broker's Firm Name. © 2019 CNYIS, GENRIS, WNYREIS. All rights reserved.